You are here: Home | Exhibitor search | AccuSharp / Fortune Products Inc.
Fortune Products Inc. focuses on one primary goal with the AccuSharp® line of products - making the most effective knife and blade sharpeners in the world. Our every effort is aimed toward creating products that provide the sharpest edge possible for your knives, tools, and equipment. Whether your sharpening needs range from the kitchen, workshop, yard, hunting, fishing or other outdoor sports, our sharpening products help you maintain the very best edge. 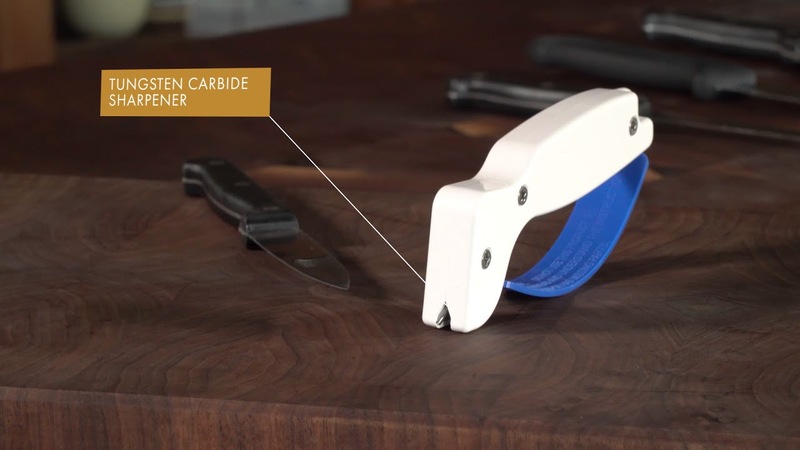 Sharpen knives (even serrated knives), cleavers, axes, machetes, and many other cutting tools in about 10 seconds. The large, ergonomic handle fits either hand & the full-length finger guard safely protects your fingers. The sharpening blades are diamond-honed tungsten carbide and provide years of reliable use. This compact commercial-grade knife sharpener combines our diamond-honed tungsten carbide sharpening blades and fine ceramic rods. This lightweight, stainless steel blade, features a removable one-hand opening pin, Allen wrench, safety lock and a comfortable grip in three of our top-selling colors; black, blaze orange, and CAMO. The AccuSharp® Game Processing Kit includes a butcher knife, caper knife, gut-hook knife, bone saw, ribcage spreader, zip ties, game cleaning gloves, with a hard-side carry case and our award-winning AccuSharp Knife Sharpener to keep your edge. This case is a must-have for your next outdoor adventure. Our stainless steel knives are made with a wide, non-slip rubber grip for easy handling. Each floor stand holds 36 AccuSharp® products and takes minutes to set up. Display as a stand-alone display, hang with ‘S’ clips (provided) or place on a counter or shelf. Mix and match colors with a multi-display that fits your store and customers’ needs.